*All ages are welcome, as are strollers, but please be aware that it is a long walk... 1.5 miles and 90 minutes with frequent stops and standing during stories. If you bring your small children and toddlers/babies, we ask that you be considerate of other patrons if your children get aggitated or fussy. We charge full admission prices for ages 2 years and up... even if they are traveling in a stroller. Thank you for your understanding! For groups of more than 20, an additional $10 per person for up to 30 guests. To arrange a time and date (depending on tour guide availability) please call 325-716-4125 or email info@betheatre.com. Yes, you can purchase as many available tickets as you'd like (up to 20) per walk if they are not already sold. WHAT ARE THE GHOST WALKS ALL ABOUT? Back for a 4th year, our popular Ghost Walks are always a complete sell out! 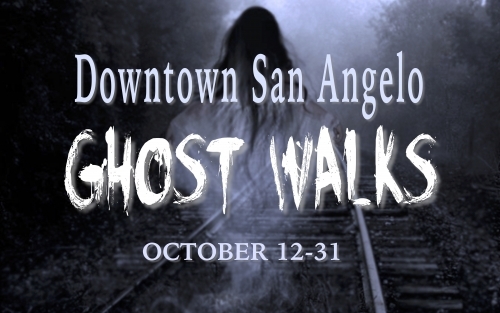 Come explore beautiful historic downtown San Angelo and learn about San Angelo’s history as we journey through the streets to some of the oldest and most haunted buildings. The Ghost Walk is suitable for all ages but does include details of our most gruesome history. We will not be entering buildings, and this is not a "haunted house." We will, however, be roaming the dark streets and a fun night for all is promised! New places and spaces will be added this year, so if you’ve already been, join us again for more hauntings and history! RAIN OR SHINE! We will not cancel walks unless weather conditions are dangerous (heavy lightening or flooding). We can exchange your tickets, but there are no refunds less than 24 hours before tour. Your tour guides work hard to make it a fun experience! Show them your appreciation with cash tips! Not required but certainly appreciated. CLICK BELOW FOR TICKETS! Get yours soon. Walks sell out FAST! !